Located just outside of the Welsh town of Talwaenydd, the Llechwedd Slate Caverns are the site of one of the world’s most incredible trampoline parks. Nestled within an abandoned slate mine that was first used by the Romans in ancient times, the giant playground is perhaps the area’s most exciting highlight – a 10,000 square foot underground trampoline park that provides fun and entertainment for the whole family. The mine was in its heyday during the Victorian age, long before it was used as an art bunker during the WWII era. In recent years, the caverns have been converted into a rather popular tourist attraction, with the epic Bounce Below trampoline park being the centre of attention. The impressively designed subterranean playground consists of three massive trampolines connected by a labyrinth of slides, stairs, tunnels, and paths. The first net is 20 feet off the ground, the second at 60 feet, and the highest sits 180 feet above the cavern floor. The level of engineering and maintenance that goes into this place is remarkable when compared to other trampoline parks. Although the setting can be intimidating, the extensive safety netting ensures that this is a safe pastime for everyone. In fact, three small trampolines were recently added to better accommodate jumpers aged 3-6. 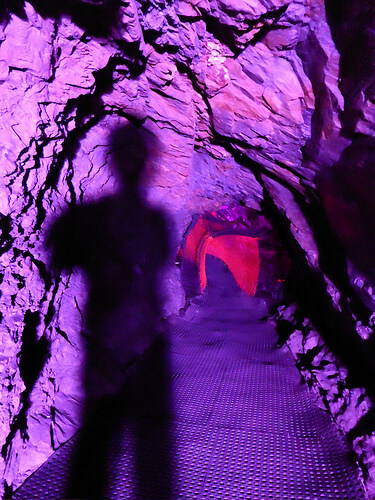 Aside from the way the trampolines are arranged, and the slate mine’s walls and cliffs linger in the background, the most memorable aspect of the park’s interior is the lighting. An array of hot and futuristic colours illuminates the rocky background to create an otherworldly vibe that gets everybody in a playful mood. Even the introductory train ride into the cavern is exhilarating with a steep 60-foot descent that leads you directly to the first trampoline in an adrenaline-filled manner. As if an incredible trampoline park wasn’t enough, the caverns are also home to Zip World, where you’ll find the world’s biggest zip line course, the fastest zip line in the world, and the longest zip line in all of Europe, all in one location. There are even plans to add a restaurant in the near future, and you can already book parties and even weddings at this venue. The strange lighting and closed cave environment makes for an awesome rush when you’re barrelling through the narrow caverns on a zip line. While the Llechwedd Slate Caverns, Trampoline Park, and zip lines are only a short drive north of the historic mining town of Blaenau Ffestiniog, the town itself and the area surrounding it are rather rural and slow. However, cave and quarry exploration are big in the area, so you might want to try a tour from Quarry Explorer or Go Below Underground Adventures. The most popular outdoor attractions include Plas Tan Y Bwlch Gardens, Gwydir Forest, Plas Brondaw Gardens, Moel Siabod, and of course the grand Snowdon National Park which is worthy of its own dedicated exploration.